We Gilflurts are noted for our artistic sensibilities, what with our harpsichords and our Wedgwood and none of us are more that way inclined than grandmother Gilflurt, a galavanter of no little renown. Her wanderings have taken her all over the world and on her last trip to Russia she brought back word of Derzhavin, a poet and statesman who occupied the highest offices during the reign of Catherine the Great. Derzhavin's start in life was far from promising and he left his rural childhood home for a life in the Preobrazhensky Guards in St Petersburg. What he lacked in formal education he more than made up for in intelligence and political skills and his career began to advance dramatically. Leaving the life of a soldier behind him after more than a decade, Derzhavin rose through the ranks of government as a particular favourite of Catherine the Great until, in 1802, he was appointed Minister of Justice. In fact, he was in the position for less than a year before political wrangling saw him removed from office and he retired to Zvanka to pursue his love of poetry. 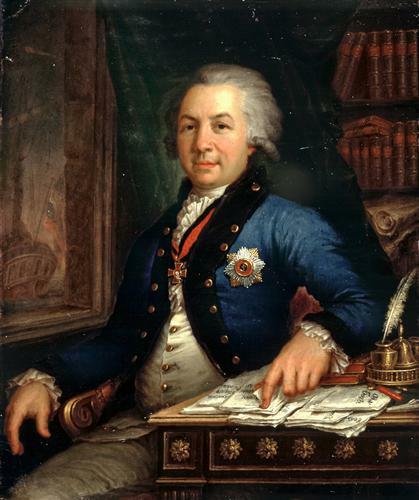 Derzhavin wrote a number of somewhat satirical odes to the adoring Empress and her court, delighting Catherine with his wit and wry attention to detail. More serious commissions included the lyrics to the Russian national anthem, the metaphysical ode, God (1785) and Waterfall, written in 1794 to commemorate the death of Prince Potemkin. His highly lyrical poems were translated into a number of languages and he was held up as a model to romantics who applauded his emphasis on the ode. Not content with his poetic achievements, he also wrote opera libretti and enjoyed a level of international fame that was unheard of for a Russian poet at the time. 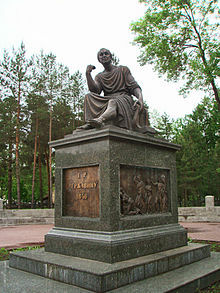 In his later years, Derzhavin attended the final exams of a certain Aleksandr Pushkin at Tsarskoe Selo where he was overcome by emotion at the young man's lyrical verse. When he died in 1816, Derzhavin was recognised as the greatest Russian poet of his time, his works covering a vast range of topics and overflowing with beautiful imagery. A final poem remained on his desk at his death, the poignant lines forever unfinished.